Last edited by yoitisi; March 2nd, 2008 at 02:53 PM. Not much to say actually I'll probably need more coffee before I come up with the next topic though...and a good scroll through the suggestion thread. Woop! Okay comments on this round. Ethion-I'm pretty much with yoitisi on this one. I think you can push it further and render out those arms more. Neat little bot, but it needs alittle more loving. artistpave- Real solid overall render I think. From a technical stand point it rocks. Hmmm...can't critique that much here. You got my vote. vorp- Haha, I love the idea behind your piece. One thing, maybe push your values some more. Most of your piece consists of the same value range so it sorta falls slightly flat. Push those shadows to give it some more depth. tsujni- your style is sweet but I think you could maybe smooth out some of those lines just slightly. Very cool design though. Trashy - the West-Indian history is complete mystery, I can totally see them using the advanced water system like that. 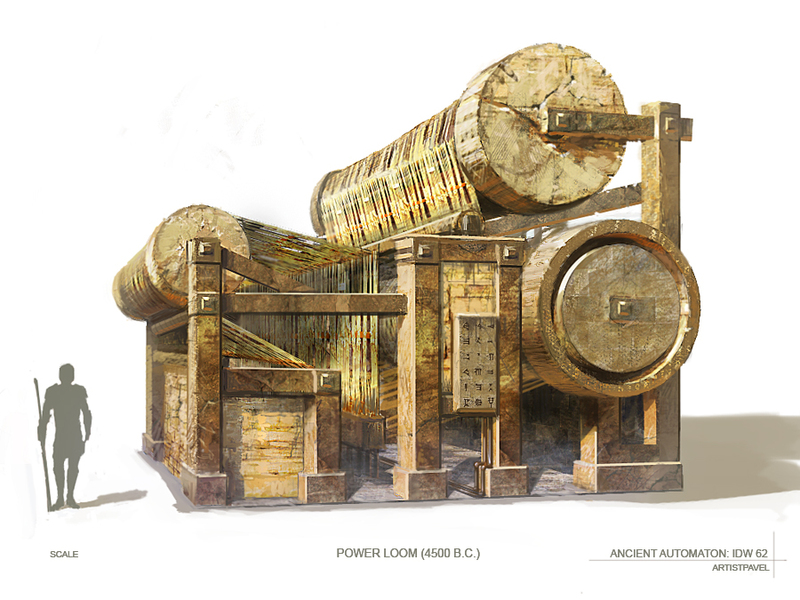 Vorp - interesting take on how Egyptians built those massive structures, my concern - the 3-leg system with "points" touching the ground may be highly unstable for a machine dealing with heavy blocks. Cool design though. Ethion, tsujni- I second Trashy, keep doing the good job guys. Last edited by Paul Dolgov; March 3rd, 2008 at 12:25 PM. Ethion Nice idea. I think your rendering confuses the form a bit too much though. That is, my eye can't quite decide where the surfaces are moving in some areas. Tightening up the structure with more construction and then rendering could help a lot. artistpavel Very clean and tight. Cool to see a simple 3d render textured like that. Struggling to find something to improve...okay, there's a bit too much light on the bottom of the right-most spindle? Feels a little 'floaty' as a result. Trashy I really like the feel of yours. Very loose and expressive. A bit tighter brushwork, especially near the base of the structure, could help. Love the figures. tsujni Cool concept and crazy wires and such! Definite Metropolis-ness. Could use some smoothing and a bit of cleanup. I'll vote for trashy I love the concept. Vorp is cool, too...but I think, there could be more deep in it...more contrast. and artistpavel: like it, too.... Its so sharp rendered. C3PO was a derivative of Maria, from Metropolis. So, I guess that makes mine a derivative of a derivative. However, I was thinking more of Maria than C3PO. That said, Lucas and I used/stole from the same material. Much improved Ethion. Very nice. C.O.W. 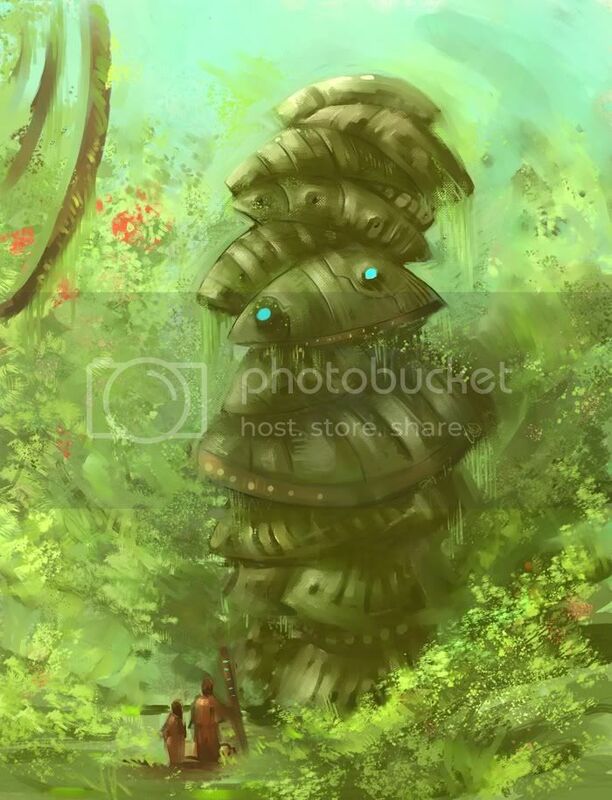 #284, ancient rainforrest protector. VOTING!